The best track athlete in history toured the facilities of the brand new venue with leaders of Lima 2019, Panam Sports and the Peruvian Capital. The Jamaican idol etched his handprints on a cement slab and unveiled a plaque commemorating his visit so that fans who attend the Pan American Games can be photographed with a memory of his first visit to Peru. 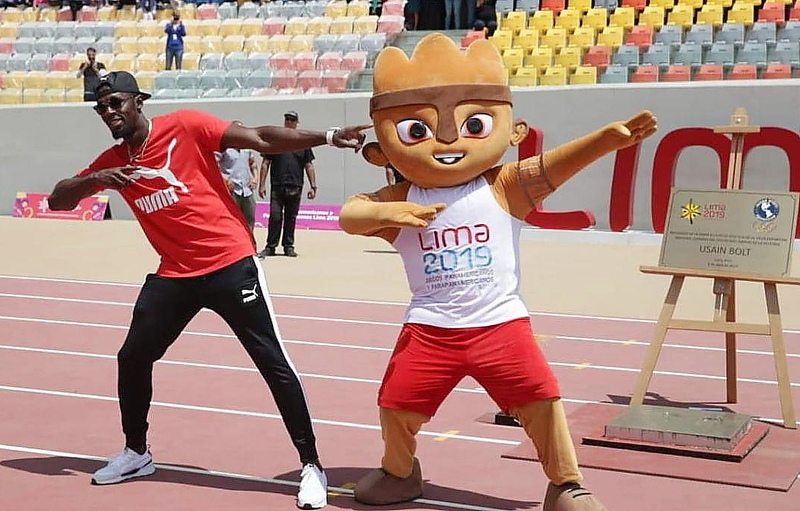 LIMA, PERU (April 3, 2019) — Although he spent just 48 hours on Peruvian soil, the fastest athlete in history, Usain Bolt, took the time to visit the venue that will host the incredible Athletics competition at the Lima 2019 Pan American Games this July. 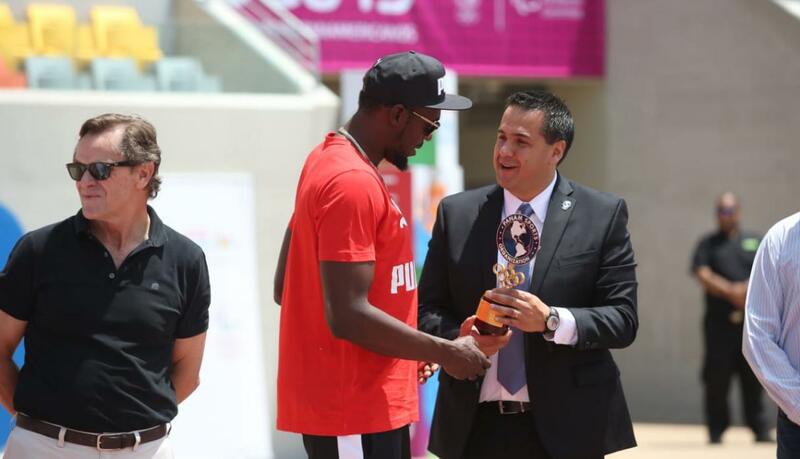 Bolt spent 30 minutes touring the renovated Athletics Stadium in the VIDENA sports complex along with the Mayor of Lima, Jorge Muñoz, Lima 2019 President, Carlos Neuhaus, and Panam Sports Communications Director, Alejandro Goycoolea. The World’s Fastest Man was greeted at the 100-meter final stretch of the track where Bolt repeatedly made history throughout his career. The authorities exchanged gifts with Usain Bolt, with Panam Sports honoring him with a book and a Panam Sports Trophy featuring the Olympic Rings. In return, the World Record-holder gave a pair of shoes, shirts and hats in memory of his visit. Dozens of media attended the event, hopeful not to miss any detail of this historic moment. After the delivery of gifts, it was time for the most anticipated moment of the event. The three-time Olympian knelt on the athletic track and put his hands in a concrete frame, “leaving his mark” on a plaque that will forever commemorate the memory of his visit and will be proudly displayed for all attendees of the Pan American Games to take photographs with. “I’m happy to be in this venue. Having this chance to tour this stadium is spectacular. In Jamaica we do not have a track like this to train. The most important thing is that it will be for the next generation. They have to appreciate these venues that will be spectacular for the future. I am happy and this track is wonderful for the Peruvians. I hope they use it and set many records. It is a track of international level and quality,” Usain Bolt said. “This is a special event for us. The presence of an international icon in the world of sport such as Usain Bolt says, clearly, the importance that Lima has as the Host City of the continent’s top sporting event. With Bolt in Lima, we send a great message to all of the Americas and the entire World: everyone wants to be part of these Games, and in Lima, as we always say, Let’s All Play!” said Lima 2019 President, Carlos Neuhaus. “The truth is that we are very happy for this activity and in turn very grateful to Puma for allowing us to have the presence of this world-renowned sports star. 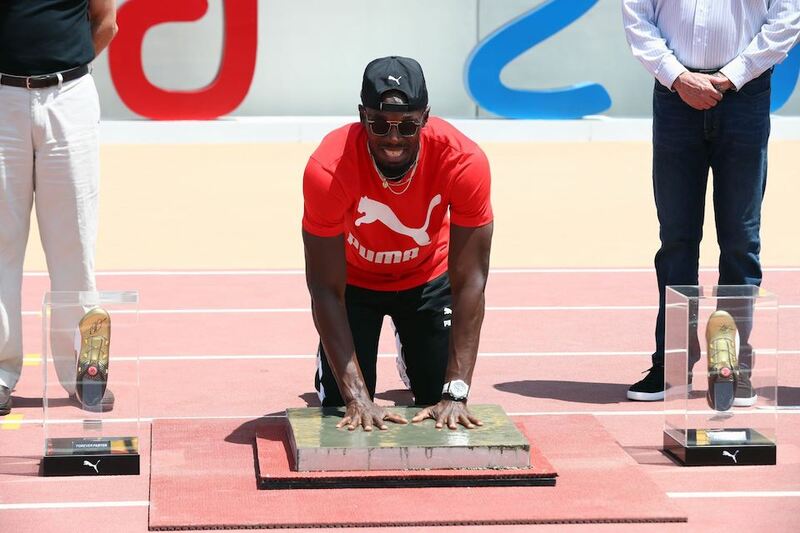 It is an honor for us as Panam Sports that Usain Bolt can be on this track and leave a fantastic memory so that all of the people who come to the Lima 2019 Games will be able to see it. “He is a very nice person, very genuine, and I invited him to come to the Games in July and I hope he can come! “said Panam Sports Communications Director, Alejandro Goycoolea. The new Athletics stadium has the capacity for more than 6,000 spectators and Usain Bolt was able to visit because it is already finished, with the venue only waiting its official inauguration. The track is made of top quality materials, similar to those used for the London 2012 Olympics and those that will be used for Tokyo 2020 next year. The IAAF subjected the surface of the track to various laboratory tests and gave it Level 1 Certification, concluding it was more than capable of hosting the fastest athletes of the Americas in less than four months. The Athletics competition during Lima 2019 will combine world-class infrastructure with world-class competition.